Filmmaker Frank Martin has been responsible for some of Hollywood’s finest moments including the life of legendary John Huston – The Man, The Movies, The Maverick and a forty year television retrospective of Walt Disney: The Wonderful World of Disney: Forty Years of Television Magic. But Martin may have topped himself by reaching back to an important yet somehow forsaken part of American history. Throughout the years since thousands of U.S. servicemen have served our country since the Revolutionary War in the late 1700’s, black soldiers have played an integral role on the battlefields. Yet their contributions somehow have been acknowledged on a minimal level with rare exceptions like the Tuskegee Airmen. 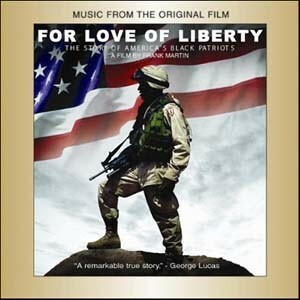 In the four-hour documentary For Love of Liberty: The Story of America’s Black Patriots (Louis Gossett, Jr. serves as one of the Executive Producers), documentation and visuals are captured from the Revolution through post911. A stellar cast (Halle Berry, Bill Cosby, i.e.) narrates the PBS-aired documentary which chronicles critical periods when black heroes changed the course of history; from an escaped slave, to the 200,000 men who served in the Civil War, to President Barrack Obama. The soundtrack is broken up into different wartime eras. Representing the Universal Soldier segment: The Irish-flavored “Minstrel Boy” mixes a gospel sense marked by the soulful voice of Alex Ligertwood (Santana) backed by the Andrae Crouch Choir. In the Civil War portion ofFor Love of Liberty: Carol Dennis-Dylan injects a haunting quality to Stephen Foster’s “Was My Brother in the Battle” while Big Jim Adams’s expressive vocal fills are the perfect foil for “Vale of Slavery,” an original composition by Doryk. Longtime Crouch associate Ricky Nelson offers a charming rendition of the immensely popular, optimistic theme the 2ndWorld War, “We’ll Meet Again.” Holliday’s recording of “Strange Fruit”is cleverly introduced with the Brown composition, “Desperate Times.” Two Christmas standards are featured on For Love of Liberty soundtrack. “I’ll Be Home for Christmas” has a mild bluesy after taste,thanks to lead vocalist Orin Waters. Then “O Holy Night” (the Korea segment) with Andrae Crouch and Linda McCrary recalls the days why Andrae and the Disciples’ blend of gospel and soul during the seventies and eighties impacted the contemporary gospel scene for the next generation. The eerie mood triggering “Mo Nam Blues” is the perfect musical narration depicting the Vietnam War era. To be honest, it is a bit difficult to judge a soundtrack with only forty-three minutes of actual content coming out of a four-hour production. If there were any bumps on the For Love of Liberty soundtrack, a couple of tracks were a bit monotonous and seemed more like filler. But otherwise, Martin, Gossett, Jr. and a host of others should be thanked for bringing theFor Love of Liberty documentary and soundtrack, so those can witness the lives of those black heroes throughout the years who fought to protect our freedoms.